Fawlty Towers Join Meds and Kell as they talk about this fabulous British Comedy Fawlty Towers. 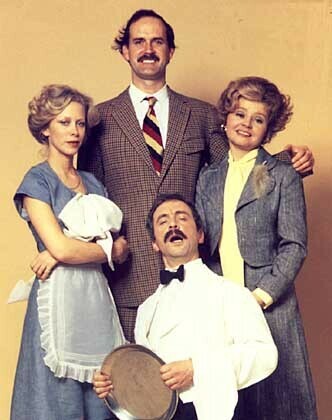 Written and performed by John Cleese and Connie Booth, Fawlty Towers is now over 34 years old and still going strong. Only two series were made and its a formula that comedians such as Ricky Gervais have taken upon themselves to keep their own comedy fresh. Also starring Andrew Sachs and Prunella Scales the team created a wonderful programme that has never been beaten. The premise of the show is centred around Basil Fawlty played by Cleese a hotel owner who is dominated by his wife Sybil and has an amazing disregard for anyone who is below what he classes as 'the best class'. A fantastic comedy that is worth not only hearing about here but must be viewed to get the ultimate pleasure of Cleese and Booths writing.